Left ventricular assist devices market to gain momentum over 2018-2024, India to crop up as a lucrative growth ground for the industry expansion « Global Market Insights, Inc. Driven by a spate of technological advancements in the domain of medical equipment, ventricular assist devices (VADs) market has come up to be one of the most lucrative verticals of the healthcare space. A VAD is essentially a medical device that is used to help with the heart functions & blood flow in patients with failing or weak hearts. Technological developments of late are making VADs less invasive, more risk-free and efficient, fueling a significant increase in their adoption rate, further advancing ventricular assist devices industry growth. These technological enhancements coupled with constantly improving implementation procedures have successfully reduced the associated health risks while also ensuring an increased survival rate in patients. The global VADs market is also expected to accumulate significant proceeds on account of the growing obese and geriatric population worldwide, a demographic most likely to experience heart problems & heart diseases. According to the World Health Organisation (WHO), a survey in 2016 discovered that over 1.9 billion adults, above 18 years of age, were overweight with approximately 650 million of them being obese. Meanwhile, a report from the United Nations predicts the global geriatric population to more than double by 2050. These factors are quite overtly, compelling further innovations in the healthcare industry, expediting ventricular assist devices market trends. The United States ventricular assist devices market is touted to be largely driven by the growing number of cardiovascular disease CVD cases across the nation. According to a 2018 report by the American Heart Association, approximately 92.1 million adults across the U.S. are suffering from some form of CVD or the after-effects of a stroke. Around 2,300 Americans lose their lives to CVDs every day – an average one death every 38 seconds. The U.S. Centers for Disease Control & Prevention (CDC) lists high cholesterol, high blood pressure and smoking as the key risk factors leading to heart diseases, further specifying that approximately 47% of Americans are suffering from at least one of the three listed risk factors. 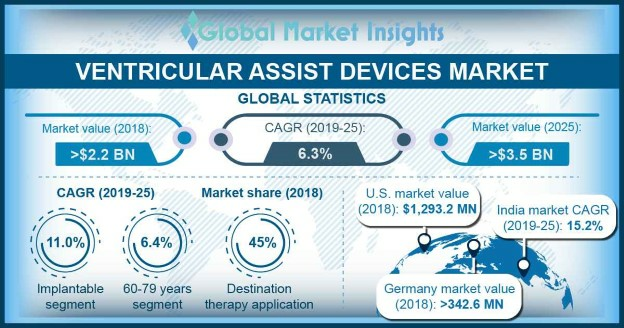 These conditions coupled with recent technological advancements across the nation as well as favorable reimbursement policies would be some of the major influencing parameters fueling the growth of the U.S. ventricular assist devices market. As a matter of fact, the U.S. ventricular assist devices industry size is projected to register a modest CAGR of 9.8% over 2018-2024. Left VADs are increasingly becoming a prevalent treatment options for individuals suffering from Stage-D heart failure with a reduced ejection fraction. According to a report published on the Journal of the American College of Cardiology (JACC), owing to technological advancements, the devices are becoming more durable and reliable, significantly extending the prospects of survival in patients suffering from the ailments. Although there are adverse effects, the device greatly improves the quality of life, claim medical experts. Nonetheless, with an ongoing organ donor shortage experienced for cardiac transplantation, the Left VADs are increasingly becoming the go-to substitute for a full-fledged transplant, especially in elderly patients. Attributing to these inducing factors, the left VADs market is projected to record a CAGR of about 10.6% over 2018-2024. The populous Indian sub-continent is anticipated to crop up as another remunerative revenue pocket for ventricular assist devices market. Quite overtly, the growth across the country is powered by the extensive prevalence of cardiovascular disorders in the region. A report presented in the AHA Journals in 2016 claimed that premature mortality (in terms of years of life lost) on account of CVD in India surged by 59% – from 23.2 million in 1990 to 37 million in 2010. Even the World Health Organization declared that cardiovascular diseases are one of the major factors contributing to the cases of mortality across the region, that would quite overtly push the India VADs market size in the years to come. The positive growth graph of India VADs industry can also be attributed to the nation’s expanding medical tourism industry, that stems from the significantly cheaper cost of medical treatment in the country. While a LVAD procedure costs approximately $175,400 in the U.S., the same procedure costs approximately $12,600 in a hospital in India that provides superlative medical treatment from skilled doctors. According to IMS Health & FICCI, India accounts for about 18% of the world’s medical tourism market. In the decades to come, medical tourism is touted to emerge as a major factor propelling the India ventricular assist devices industry growth. It is quite evident from the aforementioned trends that the global VADs market is well positioned to accumulate sizable gains over 2018-2024. Powered by the escalating prevalence of CVDs worldwide and the robust technological advancements in healthcare, the overall VADs industry size is liable to be pegged at USD 2 billion by 2024. This entry was posted in Healthcare & Medical Devices and tagged Ventricular Assist Devices Industry, Ventricular Assist Devices Market, Ventricular Assist Devices Market Analysis, Ventricular Assist Devices Market Growth, Ventricular Assist Devices Market Outlook, Ventricular Assist Devices Market Pdf, Ventricular Assist Devices Market Price, Ventricular Assist Devices Market Report, Ventricular Assist Devices Market Share, Ventricular Assist Devices Market Size, Ventricular Assist Devices Market Trends.